If you’re reading this, chances are you appreciate the thrill of turning a fast corner as much as you enjoy laying down a big patch of rubber. 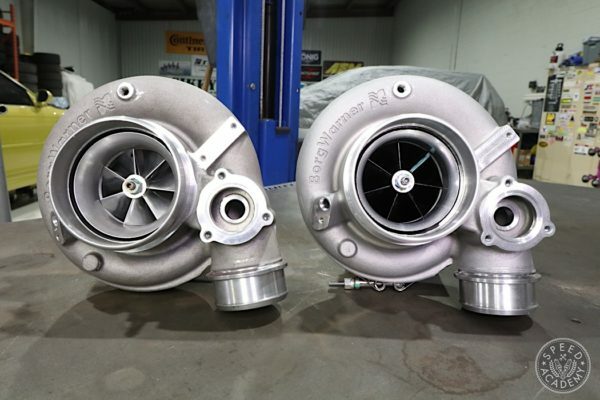 There really is more to life than living it a quarter-mile at a time, and this realization is clearly becoming more and more widespread as the popularity of Drifting and Time Attack continue to grow. 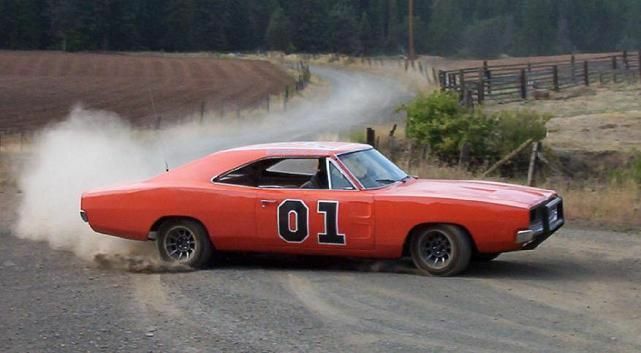 But carving the perfect corner isn’t as simple as screaming “yeehaw,” mashing the go-pedal to the floor and cranking the wheel in the direction you want to go, despite what the Dukes of Hazzard may have taught you. 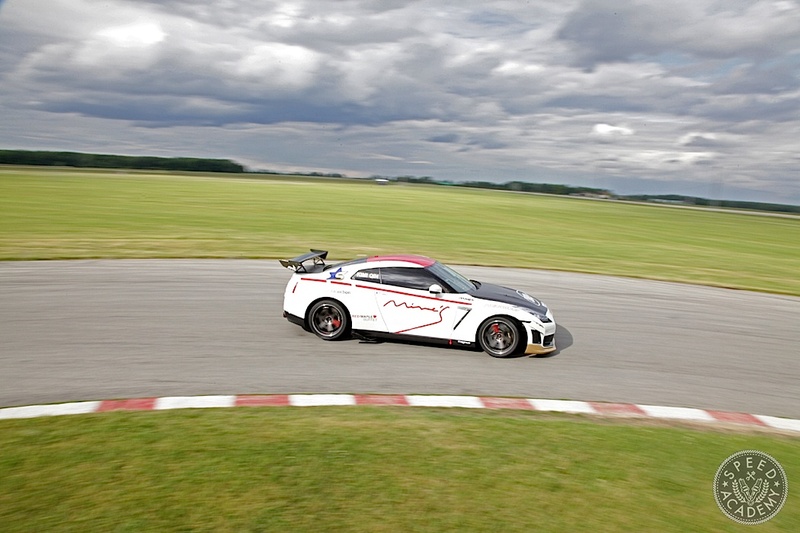 Nope, in the real world, handling balance and the dynamic behaviour of your car at speed while entering, executing and exiting a corner depends on a number of factors including roll stiffness, or how much your car resists lateral (or side-to-side) weight transfer and the body roll that comes with it. 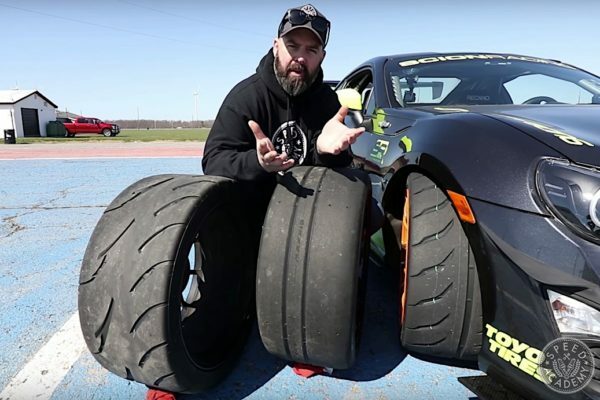 Shock absorbers, coil springs and suspension geometry all play critical roles in controlling weight transfer and limiting body roll, which in turn control wheel alignment and allow each tire to stay in more consistent contact with the road, maximizing mechanical grip in the process. 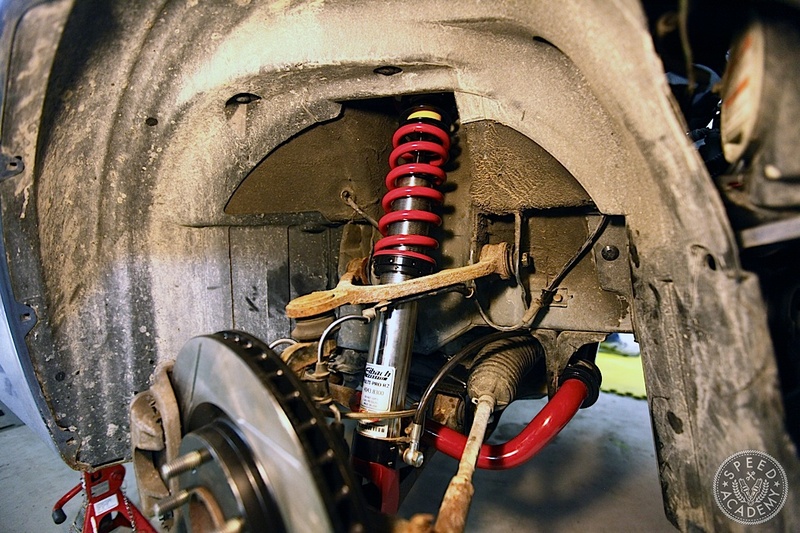 Understanding and effectively adjusting the relationship between spring rates, shock damping, ride height and suspension geometry can be a daunting task for a newcomer to suspension tuning, which is exactly why upgrading anti-sway bars is such a popular modification. 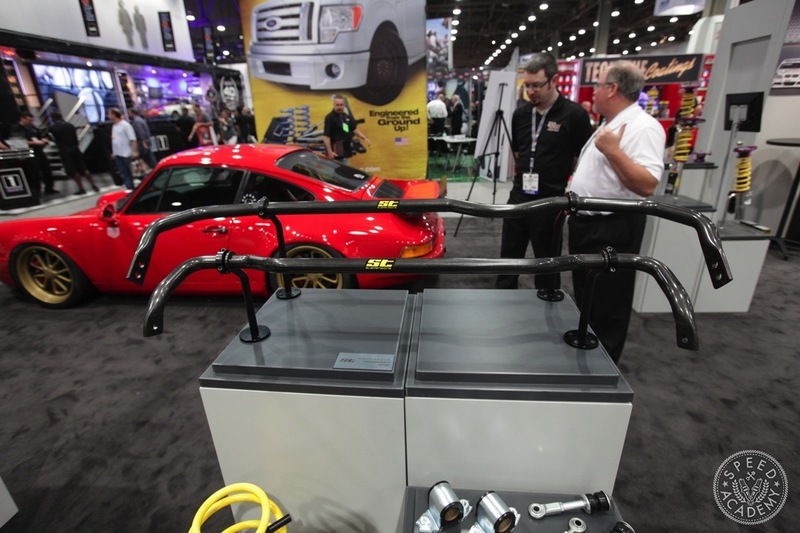 These relatively simple devices, alternatively known as sway bars, stabilizer bars, roll bars or anti-roll bars, bolt to the chassis in a central location across the front and rear axle lines and connect to each side of the front and rear suspension via endlinks. This design links the front left suspension and tire to the front right and the rear left suspension and tire to the rear right, helping control body roll while still allowing each corner of the car’s suspension to act independently. 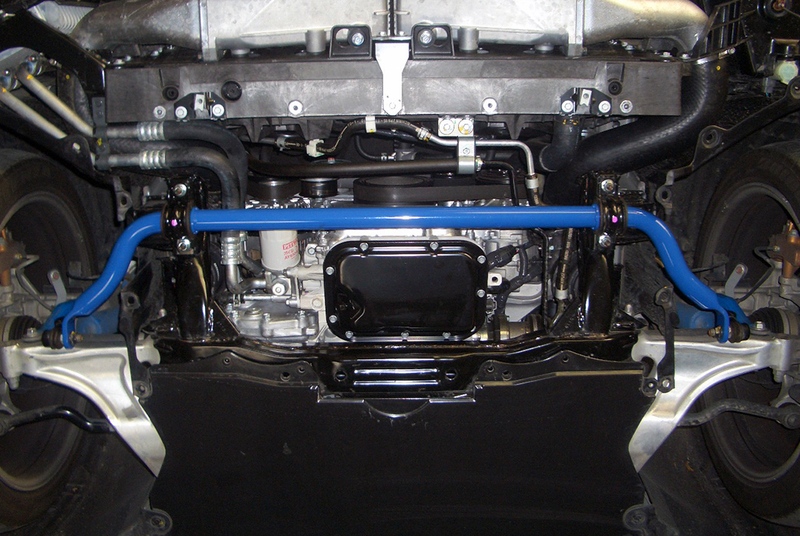 The way anti-sway bars achieve this function is by twisting, rather than compressing like a coil spring, so its torsional stiffness is what determines its lever force and thus the extent to which it limits body roll. 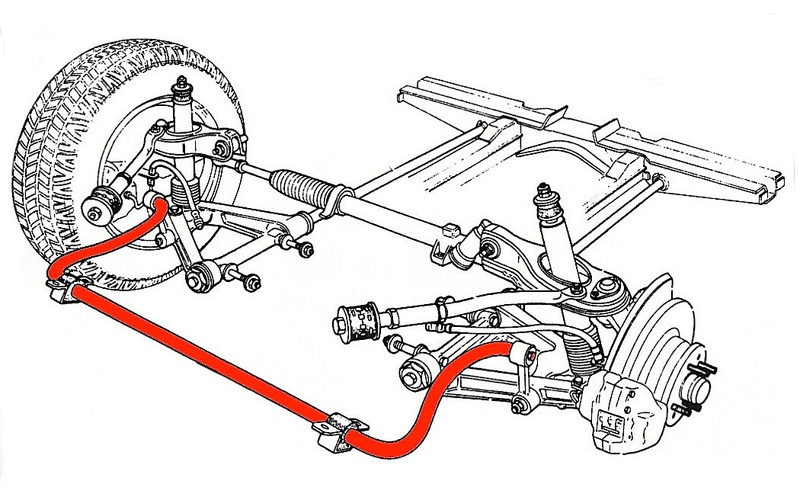 As the suspension on one side of the vehicle compresses from lateral acceleration and body rolls as a result, the anti-sway bar lever arm on the compressed side of the car will twist upward as the control arm it’s attached to moves upward, while the lever at the other end of the anti-sway bar will twist downward as the suspension on the deweighted side of the car extends into droop. 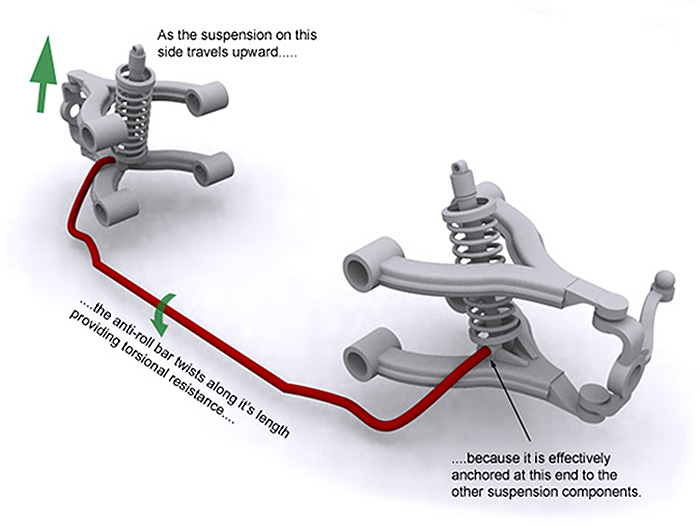 The anti-sway bar’s ability to resist this twisting is determined by its torsional rigidity or stiffness, which in turn determines its ability to limit body roll. The stiffer the anti-sway bar is, the more the compressing force on the outside of the car is transferred across the chassis, helping keep the inside suspension loaded and increasing its contact patch. 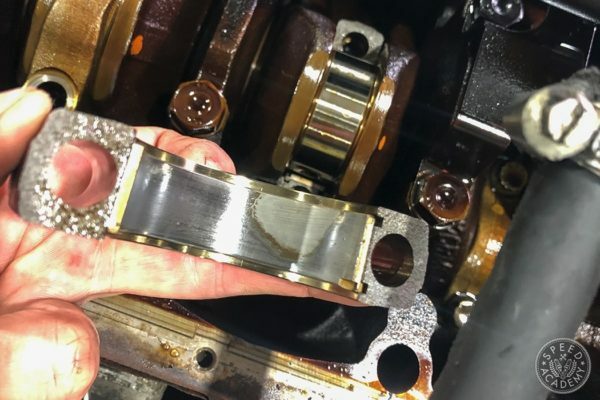 In other words, an anti-sway bar helps redirect the load being forced onto one side of the chassis during cornering by resisting the twisting motion that results from one side of the vehicle’s suspension compressing while the other side extends. 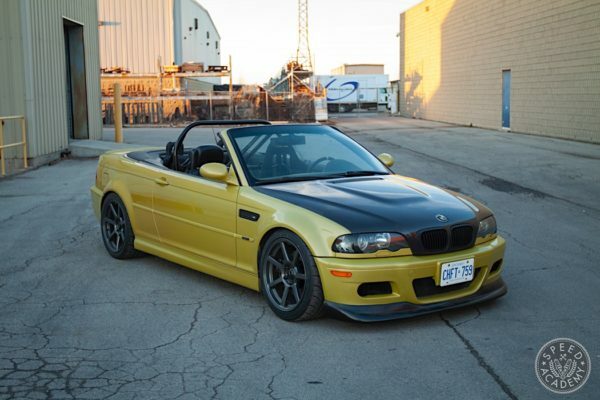 This reduces body roll and helps keep some load on the inside tires during cornering, but too stiff a setup can actually reduce the freedom with which each corner of the suspension acts independently, meaning you can start to lift the inside tire in the slower and more severe corners if you run too aggressive a sway bar setup. WRC driver Chris Atkinson does a great job of explaining this tradeoff in the video below. The torsional rigidity or stiffness of the bar and its ability to limit body roll is a function of its diameter, the stiffness of the material used and whether it’s solid or hollow, the length of the lever arms that connect the bar to the suspension, the geometry of the bar as determined by its mounting points, and the rigidity of the bar’s mounting points (and probably a few others I’ve missed). Just in case you’re into math, the torsional (or twisting) motion of the bar is governed by the equation: Twist = (2 x torque x length) / (pi (3.14) x diameter4 x material modulus). Diameter is in the denominator, so it gets larger as the amount of twist gets smaller. Further analysis of this formula reveals that torsional rigidity is a function of diameter to the fourth power, which means that even very small increases in anti-sway bar diameter make a large difference in torsional rigidity. For example, if we compare the torsional rigidity of the stock rear anti-sway bar on my ’06 Infiniti G35 coupe, which is 21mm in diameter, versus a Stillen 22mm rear bar (assuming all other variables are equal), using this equation you’ll find that the Stillen bar is 20 percent stiffer than the stock bar.